Airlines have both weight and size limitations so kill two birds with this one stone with a tape measure and luggage scale in one. Grab this high tech digital hand scale that will save you a lot of trouble at the airport by accurately weighing your luggage. 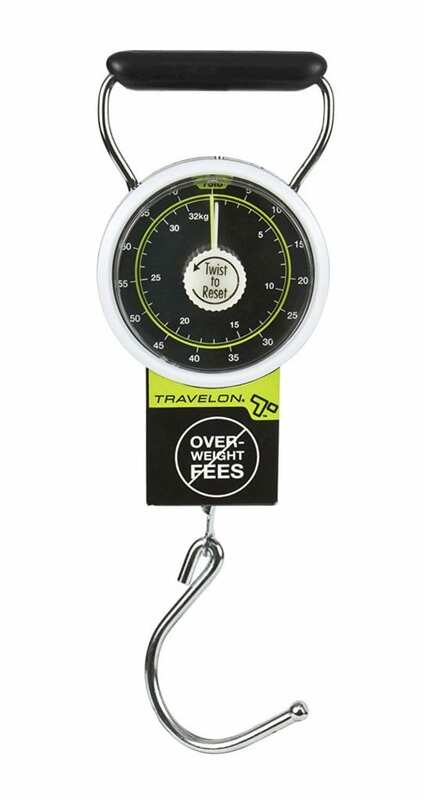 If you prefer a reliable, manual luggage scale the Travelon Stop & Lock is your best bet. The Smart Weigh Digital Scale is your best bet for all of your heavy duty luggage needs. Weigh your luggage in seconds in style with the sleekly designed Tarriss Digital Scale. With baggage regulations getting tighter and weight excess fees getting higher, many travelers, even the most seasoned ones, fall in the luggage excess travel nightmare. Need the best luggage scale to make sure you don’t fall for this mistake? We got you five. But first, let’s go through what modern luggage scales can do. Good looking? Yes, but this tool is not just attractive. High-quality and affordable electronic devices are what we’re rooting for, and this Etekcity digital portable scale ticks all the boxes in our “Best Luggage Scale” list. Here is all it can do. Design and functionality: A sleek design and intuitive use. That’s how we can describe this digital luggage scale at first sight. It is only 5.1 x 1.6 inches, which means it can easily fit in your bags and smaller purses. 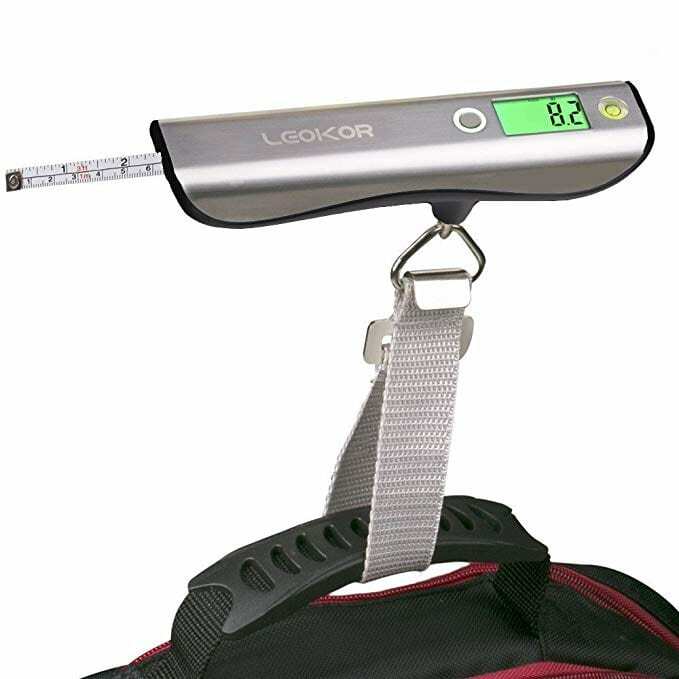 Use the strap to hook the scale to any suitcase and instantly read the weight of your belongings on its LCD display. Sturdy material and high capacity: This heavy duty scale has a durable steel hook and rubber paint technology to ensure the scale stands the test of time. The scale can measure up to 110 lbs (50kg) and has a precision accuracy of 0.1 lb/0.05kg. High accuracy and easy reading: This handsome fella can get your scale as accurately as it can get. After stabilization, it will show you the result clearly on the digital LCD display in the pound and kilogram units. Tare function: Have you ever indulged yourself in gifts and souvenirs after a trip? From personal experience, once the shopping adrenaline rush is over, packing is a lot less enjoyable. It’s hard to guess the added weight of each item, especially if there is no indication of their weight on the packages. That’s where the tare function is a lifesaver. You can reset the Etekcity to zero with a container attached to it and know the individual weight of each item in your luggage. 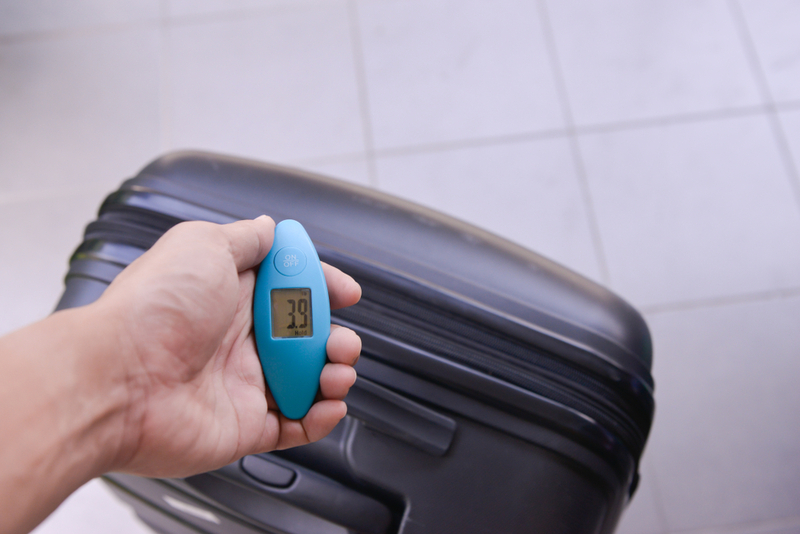 Temperature reading: Have you ever considered the temperature of your luggage? This one is a bit more peculiar concern, we know, but it’s totally legit. If you’re packing (expensive) temperature-sensitive items like cheese, chocolate, and wine, it’s better to know if they’re stored in good conditions. The thermometer can read temperatures in both F° and C°. No heavyweights: The Etekcity digital hanging luggage scale can’t lift more than 110lb/50kg. Keep reading to discover which scale we recommend for heavy duty weighing. Battery usage: The battery can’t hold too long. 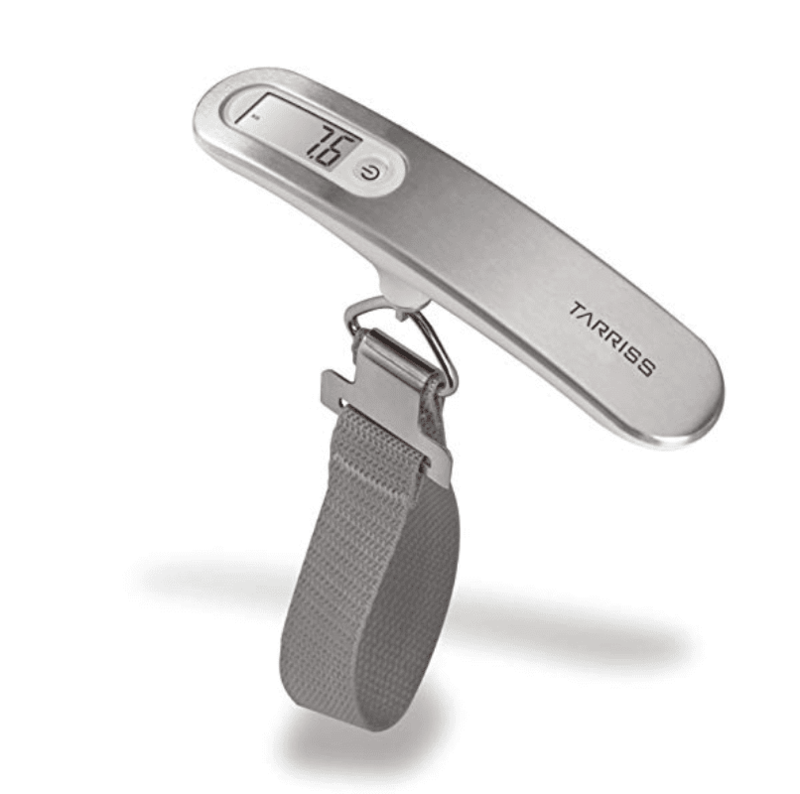 The best digital luggage scale we came across is, without any doubt, the Tarris Jetsetter scale. One look at the reviews will show you how enthusiastic the other customers are too. Seeing what it has to offer, it’s honestly hard not to feel particularly excited about this one. Futuristic design and long-lasting material: We never knew that weighing luggage could someday look cool, but with this fashion-forward Tarriss Jetsetter digital luggage scale, it is definitely possible. Made with durable stainless steel on the top plate and high-strength plastic on the bottom plate, the scale is both durable and lightweight. High capacity and accuracy: A maximum capacity of 110lb/50kg with an accuracy of 0.2lb/0.1kg is what his cutting-edge digital luggage scale offers. And since the devil is in the detail, we absolutely love the fact that this jewel has a lock weight function. It’s now easier to read the weight of your baggage after you stabilize it. Tare function: Never have to guess again. Now you know exactly which items you can discard if your luggage is overweight. LCD display: The easy-to-read display doesn’t consume much of the battery, which improves its life. Lithium battery and automatic shut-off: Not only are lithium batteries much lighter than regular batteries, but they also last longer. The best digital scale on our list also shuts off automatically after 30 seconds to preserve its battery. The scale also provides a low-battery indicator. Lifetime warranty: Just like with their TSA-approved locks, Tarriss is well-known for backing many of their products up with a lifetime warranty. The peace of mind of your product has a 100% satisfaction guarantee is not something to look down on. If you’re looking for a gift for a frequent traveler, the Tarris Jetsetter might be the perfect option! Weight accuracy: It is a little bit less accurate than other scales on the list. Power button: There is only one button to the device on or off and to control the features, which means that in case of malfunction, you can lose both abilities. Leaning more on the traditional side of scales? You will love the Travelon Stop-N-Lock luggage scale. Simple and yet high-performing, it captured the hearts of many reviewers. Stop-and-lock mechanism: One of the two hands of the scale stops and locks at the weight of your luggage. This patented mechanism will allow you to read the dial easily without bending your back to get a look. Robust and durable: Big brand names have a certain appeal. They accustom their clients to products of the highest quality. Travelon is no different, as it made the Stop-N-Lock with robust and durable metal, a strong hook and a solid handle that falls down to reduce length. If you’re looking for a rugged and tried-and-tested luggage scale that won’t let you down, this is the one. Easy reset: You just need to turn the knob back to zero to reset the scale after it was locked down. Reliable: This lock may not have all the fancy features of a digital scale, but sometimes, that’s exactly the point. Who knows when your battery will decide to die on you, leaving you high and dry when you need it the most? You don’t have to worry about that with this lock. Easy use: Everyone will know their way around this scale. Even the techiest or traditional travelers will know what to do to operate this scale. Measuring tape: You need to make sure your luggage meets size requirements, so the included measuring tape is a handy feature. Are you bringing a small statue from Italy or carved wood from the Philippines to redecorate your home? If yes, you don’t want to be paying unexpected astronomical fees for their weight. A regular scale might not make the cut for the mission of weighing them accurately. The Smart Weigh digital heavy duty scale will live up to the task. Heavy duty and multi-purpose: Sending some heavy gifts home? With its wide platform made of durable stainless steel and capacity of 440 lb/200 kg, the Smart Weigh is all you need to your weighing, shipping and mailing needs. Practicality and easy reading: No more lifting. Simply put your package on the platform and read the weight on the LCD screen. Thanks to a long extendable cord, you can move the screen box for better reading, no matter how big your luggage is. Tare function: Get an empty box on the scale, re-zero it, and put different items of your baggage in it to read their net weight. USB cord: Who can say no to an extra power source? In case the battery dies unexpectedly, use the USB cord to charge your scale. 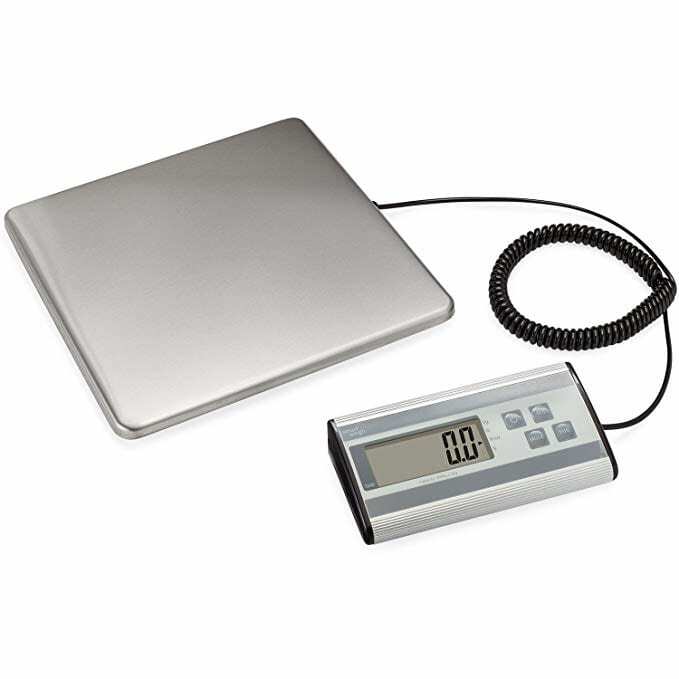 Different modes: This scale operates in kilograms, grams, pounds, and ounces. 2-Year warranty: The W-word is sweet as honey to any traveler’s ears, particularly when you can use a warranty for two years. Price: You get what you pay for. In this case, that means that this option is heftier than a regular scale. Minimum weight: This scale weighs items heavier than 6 oz/17 0g, which could be an issue for some travelers. Unlike with weight, you can’t just cut the dimensions of your carry-on luggage to fit the airline’s requirements. Better avoid this travel nightmare by knowing the measurements of your luggage well in advance. You can do this with the beautiful LEOKOR hand scale with a tape measure. High capacity and precision: The scale measures up to 110 lb/50 kg with an accuracy of 0.1lb/50g. Reliable material: Made of stainless steel and plastic baseboard, this device has a high-grade design. This scale is made for longterm usage. Tape measure: The tape comes in the imperial and metric system. Overload Warning Light: As soon as you go over 50 b/20 kg (which is also considered the luggage weight limit for many airlines in the economy class), the screen turns from green to red. Battery use: This digital scale has an auto-off function that shuts down the device after 60 seconds and a low battery indicator. It’s also worth mentioning that it uses 2 AA batteries (included), which are fairly easy to find. A digital scale is no longer just an optional travel accessory or luxury. A scale is now a sound investment that can make the difference between you shelling out thousands in baggage fees or having the smoothest baggage check-in experience one can wish for. However, you want this purchase to be worth your money. More importantly, you need the scale to do its job perfectly: read the weigh of your baggage accurately. But it’s 2019, and you can bet that the best luggage scale out there doesn’t just do that. It’s tech time now. While some scales remained in their classic form, others are now digital. Scales also have a bigger capacity, a better reading accuracy and some extra features we wouldn’t mind paying an extra couple of bucks for. Read along to discover the latest trends in the world of luggage scales. There are two routes to take: the one where you don’t rely on the hazards of tech products and the one where you like to get all the best features available to you with bonus points if it means discovering new technology. No matter which way fits you best, there is a manual luggage scale or a digital luggage scale that will fit your needs just right. Different scales have different capacities, and thus different price points. The majority of digital luggage scales can lift up to 110 lb/50 kg unless they’re heavy duty. The manual scales usually have less capacity. All the scales we picked for you above have the best reading accuracy on the market. Almost all of them also have a weight lock feature, which freezes the result of the weight of your carry-on on the screen for 5 or 10 seconds after lifting the bag to give you more comfort reading the result. Do you prefer the metric system over the imperial one? No problem. You can choose a scale with a converting feature and you’re all set to go. Important note: even the best luggage scale can give you slightly different results than the ones at the airport. It is always advised to keep your baggage a couple of pounds lighter than the maximum airline allowance. Who can say no to a little extra? Keep on reading to discover what else you can do with your luggage scale. Tape- Baggage restrictions don’t just concern weight. They also cover dimensions. If your mom handed you her favorite suitcase without its info tag, you can now make sure it complies to your airline’s conditions by measuring it first with the tape available in your scale. Backlight- LCD displays offer better reading conditions. The contrast in the backlight screens shows the numbers more clearly, which is handy if you’re a poorly lit room. What Is the Best Way to Weigh Luggage? Some people weigh their luggage using their bathroom scale and a lot of math. Others guess the overall weight of their baggage by comparing it to gym weights. People might use different methods, but one thing in common: they’re not accurate. To weigh your luggage correctly, hang it on the strap or the hook of your scale or put it on its platform. Will the Airline Accept My Luggage Scale Readings? Airlines will always weigh in your luggage, no matter how much you do it yourself at home. How Much Do Airlines Charge for Excess Baggage? What do you think the best luggage scale is? Do you have a favorite one? We’d love to hear your thoughts! Finally, once you made sure you’re complying to the weight limits, now you have to secure your belongings. What’s better than a TSA-approved lock to do so?